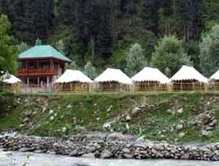 Just 12 km from Sonamarg lies a lavish camp called Nature Camp Resort offering amazing views of Himalayan ranges. Staying with friends or family amid the emerald beauty is a great experience in itself. One can also relish bonfire in the evening or can go on for a walk in the forest. It is one such place that must not be given a miss as it brings a wide array of facilities to cater to every guest needs. The closest airport is Srinagar which is located at a distance of 82km and the nearest railhead is Jammu. It is accessible from some of the famous attractions in a beautiful place of Sonamarg. Accommodation The hotel renders 15 luxury tents which have been furnished beautifully to make your stay comfortable. With its convenient location and matchless hospitality, it makes for the perfect place for nature lovers and adventure enthusiasts. Some of the in-room facilities include tea/ coffee maker, quality mattress, room service, telephone, television and attached washroom. Dining The resort has a dining hall where you relish various varieties of dishes like Indian, Chinese, Continental and Ladakhi. One can also relish the food while having a view of the beautiful surroundings from the comfort of his/her room. Make the most of your holidays in Nature Camp Resort by booking a stay from the reputed organization – Tour my India. Booking in advance would be the best choice for anyone seeking peace and comfort.